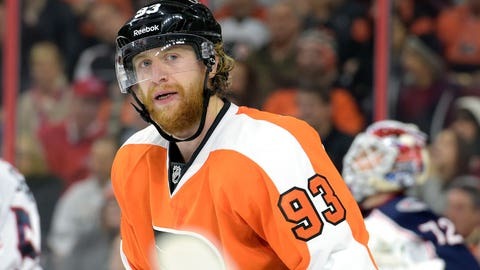 Philadelphia Flyers forward Jakub Voracek has struggled out of the blocks this season. Philadelphia Flyers forward Jakub Voracek admitted he initially wasn't worried after being held without a goal in the first four games of the season. Two weeks – and four more scoreless games – later and Voracek is fit to be tied. Voracek, who has set up three goals in 2015-16, is well off the pace of last season's career-high 59 assists and 81 points. It's certainly not for a lack of trying as the 26-year-old matched a season high with six shots on goal Tuesday. Signed to an eight-year, $66 million deal in the summer, Voracek could very well be pressing after his 22 goals last season were one shy of his career high in 2013-14. Voracek looks to get it in gear as Philadelphia (4-2-2) hosts the Metropolitan Division-rival New Jersey Devils (4-4-1) on Thursday.